I'm back, ready to continue our journey through Italy… after a couple hours in Pisa, the Fam and I continued onward to the amazing city of Rome! Rome is quite the metropolitan area, and full of so much history. We definitely could have spent more time there. Everywhere you turn is a ruin of some sort. I think the Hubs and I will go back someday and explore more, but we were happy to see the major sights on this trip. Sadly, the tour we were on wasn't good at all (review coming soon! ), but we broke away and enjoyed our time anyway. Being silly, and enjoying some gelato! I find the Italian people as a whole to be extremely friendly. People were willing to help and offer assistance more than once. Our servers at restaurants were especially entertaining. One of them even FaceTimed with us as we chatted with family back in the States! The one major concern in Rome is the pickpockets. At least 3 times we were warned by the police to keep extra watch on our purses, etc. I highly recommend using an anti-theft bag, or a waist wallet. Often, the metro is so crowded you will literally be nose-to-nose with other passengers. This is a prime opportunity for pickpockets to grab your stuff. My mum had an issue at one of the basilicas… a small child attempted to unlatch her bag and put his hand in. Luckily, she had an anti-theft purse and he was unable to get in. So be aware, my friends! 1. Use the metro - Take a little time before your trip, and study the metro map. The system is fairly simple to understand, and it is inexpensive. And it will save your feet a lot of hurt! Rome is quite large, and especially hot during the summer months. Make the most of your time by getting around quickly. 2. Buy advance tickets - The lines at most of the monuments and tourist attractions are outrageous. Buy your tickets in advance if you can, especially for places like the Vatican and the Colosseum. Also, many of these attractions have free entrance on the first Sunday of the month. We visited the Colosseum this way, arriving early and entering for free as soon as they opened. You can save a bit of money this way, if you don't mind waiting in line. 3. Appropriate dress - Though Rome is quite hot in the summer, many of the sites (such as the Sistine Chapel) require a dress code for entry. Research the sites you wish to visit, and plan ahead for this. It would be awful to arrive, tickets in hand, yet be unable to visit. 4. Shop for groceries - Rome is a very expensive city to visit. If you can, I highly recommend shopping for groceries. You don't need a full-size kitchen to do this. Although we stayed at a hotel, our room had a refrigerator. We purchased bottled water, yogurt, fruit, sliced meats and cheese, and bread. We tried to eat breakfast in our room, enjoy a large meal late in the afternoon, and then snack on our other purchases at night. This can save you a lot of money! 5. No photos - There are several places where you are not allowed to take photos, including the Sistine Chapel. Circumvent these rules at your own risk. Especially inside certain areas of the Vatican, the security guards have no problem confiscating your equipment and it will likely not be returned. You've been warned. 6. Gladiators do not take pictures for free - Outside the Colosseum are gladiators, ready and waiting to pose for pictures. But these are not free! Ask first how much the price will be. If you take the photo without discussion, you are then obligated to pay whatever they ask. 7. Don't take the roses - Particularly around the Spanish Steps, people try handing you roses. The minute you take it, you've bought it. Don't be fooled by their comments, like: "Oh, just for picture. Take for the picture". As you can see, The Kid wound up overloaded with roses, even though we thought we knew better! The next time I visit this city, I'll add more tips. Our time there was so short, I didn't learn as much as I hoped. If you've visited other areas of Italy, expect Rome to be different. 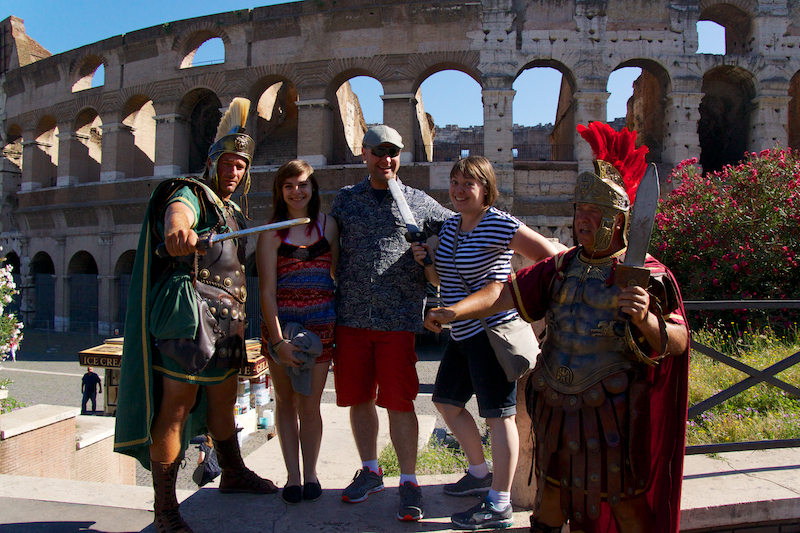 I've seen many smaller towns, so Rome was a little overwhelming at first. It's quite a bit larger than I expected, crowded, and comes with the usual large city issues. Don't get me wrong, it's definitely worth seeing, but it is best to be prepared. Until next time my friends, happy travels!